HARRISBURG (WSKG) — The US Agriculture Department is laying out its preferences for a new farm bill–a massive plan that accounts for almost a half-trillion dollars in spending over five years. 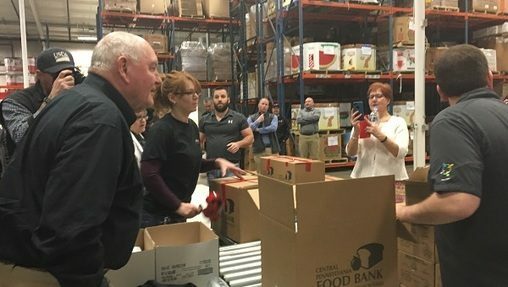 Secretary Sonny Perdue spent Wednesday in Pennsylvania, explaining the four-page skeleton proposal to groups that included farmers, state officials, and nutrition benefit recipients. To that end, the USDA is pushing for work requirements in the Supplemental Nutrition Assistance Program, or SNAP, which used to be known as food stamps. “Serve the people who need to be served, do that in a compassionate way, in a generous way, but then, [don’t] have everyone who can game the system be in,” Purdue told reporters. Nutrition assistance is responsible for a significant majority of farm bill spending. Perdue said he wants to free up more money to — among other things — create a “safety net” for farmers. That would likely include things like crop insurance. Joe Arthur, with the Central Pennsylvania Food Bank, said he appreciates the focus on agricultural programs — but cautioned against broad price cuts to other assistance efforts. The last time the farm bill was negotiated, five years ago, one relatively popular suggestion was to cut funding for SNAP benefits by 10 percent. Russell Redding, Pennsylvania’s agriculture secretary, said he doesn’t think the discussion should be framed as nutrition programs competing with agriculture and production programs for federal cash. He thinks the solution lies somewhere in the middle–like for instance, the Pennsylvania Agricultural Surplus System, which routes food waste from farmers and supermarkets to food banks. “When you look at the total expenditures, of 80 percent going into food nutrition, 20 into others, I think a fair conversation is, how do you meet the nutrition needs of our citizens by way of agricultural production?” he said. “I would encourage this direct connection between production and the charitable food system,” he added, noting he hopes the commonwealth’s PASS system could serve as a model for a broader, federal food surplus program that would lessen the burden on SNAP. Spending on nutrition programs like SNAP has fallen as the economy has improved. Just last year, it dropped 15 percent.